Under some specific circumstances, it might be handy to run as system. RunAsSys will launch a process as the local system account. This require local admin rights. A simple GUI using Windows volume API to list, mount, unmount volumes. A simple GUI to perform basic tasks on disk partitions. 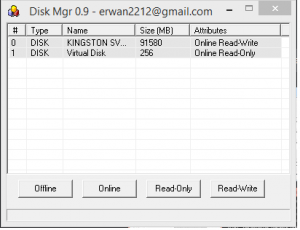 DiskMgr has been developed primarily for use in a Windows Forensic Environment (WinFE) to provide a user friendly method of changing the following DISK attributes : Offline, Online, Read-Only, Read-Write. DiskMgr is similar in use to Colin Ramsden’s « Write Protect » application (see here). DiskMgr is available in native Windows 32-bit and 64-bit versions.